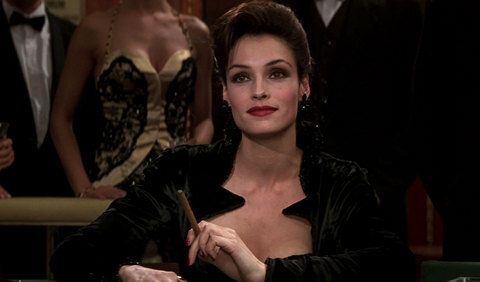 Famke Janssen made both her film and television debuts in 1992, but it wasn’t until a few years later, when she became a Bond girl by the unforgettable name of Xenia Onatopp in “GoldenEye,” that everything started to come up roses for her. In the intervening years, Janssen has made multiple films, most notably starring as Jean Gray in the “X-Men” franchise, but 2013 marks her inaugural foray into a full-time TV series gig…and by “TV series,” what I really mean is a Netflix series. “Hemlock Grove,” produced by Eli Roth, kicks off its first season on Friday, April 19, but Bullz-Eye was fortunate enough to chat with Janssen way back in January, at the Television Critics Association press tour, about her new series as well as a few of her past films. Bullz-Eye: “Hemlock Grove” marks the first time you’ve ever taken on a series-regular role for television. Did you have any trepidation about taking that kind of a plunge for a show that’s being delivered to viewers in a non-traditional manner, or was that part of what drew you to it? Famke Janssen: Trepidation about that element? No. Doing a series, period? Yes. [Laughs.] But to me, I think the fact that it was for Netflix and not your traditional network or cable show was one of the deciding factors—or certainly an added bonus, anyway—because it felt like we were kind of in the wild west, with new territory to explore. It wasn’t this whole weight of a specific way of working that we had to carry through in some way. So with that, I was hoping that there would be less control coming from above, and not so much like a big studio standing there with a whip, making you feel like you’re more of a puppet than anything else. Also, the whole 13-episode part was attractive as well, because I’m designed my life in such a way now that I’m trying to go back and forth between writing and directing and acting, and signing up for something that would’ve taken an entire year, as a network show would’ve…I hadn’t considered that at all, just because I don’t have the time for it. I don’t want to tie myself down. So in that regard, it was a perfect set-up, because I can make money and then I can pursue my passion of writing and directing in my free time. BE: So what can you tell us about Olivia Godfrey without divulging anything too spoiler-y? FJ: Olivia’s still mysterious even to me, and I’ve lived with her now for 13 hours onscreen, not to mention many more hours shooting the series, of course. She’s married into this Godfrey family, a family with a lot of money, but she comes from a lot of money as well…or she seems to, anyway. But whether she does come from a lot of money or where she really comes from or what her deal really is, nobody really knows, and maybe nobody will ever find out. [Laughs.] She’s highly manipulative. She loves her children, but she’s also somebody who just has an agenda most of the time. And she’s in love with her husband’s brother, and…there are all sorts of integral relationships with bizarre things going on within this small town as well as with these family members. [Shrugs.] It feels like “Twin Peaks” to me. That’s what it felt like. That’s the reason why I really liked it: because it is, in a good way, nonsensical. It’s not linear. You’re not gonna…not everything is going to be explained. There are going to be a lot of mysteries surrounding it all. Nothing is going to be wrapped up with a neat bow. BE: It’s certainly appropriate for an Eli Roth production to have a David Lynch feel to it, given that the latter did a fair amount to launch the career of the former. FJ: Exactly. Yeah, and it was one of the things that we all talked about in the beginning, in terms of the look of the show and the feel of the show and all of that. BE: Obviously, Mr. Roth wasn’t able to be here today for the “Hemlock Grove” panel, but how interactive was he as far as the day-to-day goings-on of the series? FJ: Well, in addition to producing, he also directed the pilot. But then, like the way that both network and cable TV shows are filmed, you have circulating directors who come in and out for the other episodes. FJ: [Long pause.] Okay, I’ll go with that. [Laughs.] If that’s what they want to call it, then I’ll go with that. BE: You brought it up a moment ago, but I wanted to ask you a bit about the experience of writing and directing “Bringing Up Bobby,” which you produced as well. Clearly, it was a positive one. FJ: Yeah! It was really… Actually, just yesterday, I got the most incredible review, one where I was finally, like, “Okay, that’s exactly what I tried to do, and somebody got it.” It felt so good. I know, you’re not supposed to read reviews, because if you’re gonna believe the good ones, then you’ve gotta believe the bad ones, and all that stuff. But once in awhile, it’s nice when someone gets exactly what you’re trying to do. It’s now going to be released on DVD, and it’ll be viewable on Netflix on Demand soon and you’ll also be able to order the DVD from them as well. It’s just been such an incredible learning experience, and that’s what I wanted it to be. I made many mistakes on it, but I learned an incredible amount of stuff, so I can’t wait to do it again. I can’t wait to get better at it. I love film so much that it’s frustrating for me to be an actor sometimes, because I’m only allowed to be part of a tiny little element of it. It’s that feeling when…it’s, like, you’re on set, you film your portion, and then they go, “You can go now,” but you go, “I don’t want to go! I want to stay! I want to watch what happens!” [Laughs.] That’s the great thing about being a director: you’re always there. I loved it. And it suits my personality. BE: Are you willing to admit to the biggest mistake that you made while working on it? BE: Fair enough. What’s your favorite obscurity? FJ: Well, I did “Monument Ave,” which probably nobody saw, that Ted Demme directed. BE: Actually, that’s funny you should mention that movie: I actually talked to Greg Dulli (who played Shang in “Monument Ave.”) about it a few months back. FJ: Oh, okay, then that’s not that obscure, either, is it? [Laughs.] I’m sure anything I say won’t be obscure to somebody, but how about…oh, what’s the one with Harvey Keitel? It’s set in part of L.A. “City of Industry”! I have a big list of obscurities. There’s also “The Gingerbread Man,” by Robert Altman. A lot of people didn’t see that. BE: How was it to work for Robert Altman? FJ: Fantastic. You know, Deran Sarafian, who’s one of our big directors on “Hemlock Grove,” he was an incredible influence throughout this whole process for all of us, somebody who really helped us a lot in finding the look and feel of the characters on the show…he’s related to Robert Altman. BE: What was it like when you met with Altman for “The Gingerbread Man”? It seems like everyone I’ve spoken with who’s been in one of his films , they didn’t so much audition as they just kind of met with him for a bit and chatted. FJ: I don’t know! It’s a good question, but…I can’t even remember! But then I’m just so blown away that I had that experience at all, that I got to work with him. BE: There’s a story which has made the rounds that you were up for the role of Jadzia Dax on “Star Trek: Deep Space Nine.” True? FJ: Yep. They offered to me, I believe, but I didn’t do it. I’ve always been very scared of television series. BE: Setting aside its horror-themed content, was “Hemlock Grove” as scary as you’d feared? You survived 13 episodes, anyway. FJ: And 13 was just enough. [Laughs.] That’s not a statement on the show. It’s just that, to me, television is…oh, this is a terrible comparison, because it’s really not fair, but it’s like having a good nine-to-five job, like working at a bank or something. I never want to have that feeling, because to me, what draws me so much to what I do is that every day is different. And I’ve seen it with friends who are on television shows, mostly network, where they go all year and…it becomes a little bit like that. So, yeah, 13 episodes was just enough. My life is full of surprises, and I love that aspect of it. BE: And yet you did have a pilot (“Alibi”) in the works a few years ago, didn’t you? FJ: I did, yeah. It was with the people from “House” (David Shore and Peter Blake). BE: That must’ve been a scary prospect, then. FJ: Oh, I was definitely sweating buckets on that one. [Laughs.] But it didn’t get picked up, so…everything worked out for a wonderful reason, I guess, in this case, because I ended up being able to make my own movie, and I’ve worked with a very interesting group of people on this show, while continuing to do all the things that I want to do on the side. BE: Lastly, I would be remiss if I didn’t ask you about the experience of being a Bond girl in “Goldeneye,” especially with the film franchise having celebrated 50 years. FJ: Well, can I just tell you that I presented at the National Board of Review? I presented to Barbara Broccoli and Daniel Craig, because (screenwriter/producer) Michael G. Wilson couldn’t be there, the William K. Everson Award for Film History for 50 years of James Bond. So it was great to be a part of it. They put this incredible montage together, kind of an elongated trailer, of all 50 years of Bond, and it was just so astonishing to look at. Because, I mean, we’ve all seen the movies, but to put them all together in one show reel, it’s just…I’m so blown away by what they’ve done, how they’ve kept this franchise alive for 50 years. Can you even imagine? And they haven’t even changed it that dramatically over that time. Just enough. And before you can get bored of any Bond, he’s been replaced with another one. And little tweaks like making M a woman or…whatever thing happens. The women, who were clearly completely objectified, have moved into having a little bit more to do. [Laughs.] Like my character, who I feel was a very strong, interesting character to play, yet still with a wink to the audience. So I’m very impressed with the way they’ve kept the franchise going. BE: How was it working with Pierce Brosnan, given that it was his first time at bat in the role? FJ: Well, it was a lot of pressure, both for him and for the franchise, because it was the first Bond film in, what, seven years? So there was a lot riding on it…and probably, had our film not worked, it might have ended the franchise. So I’m sure there was a lot of pressure for him, but he did it swimmingly. And I had fun. In fact, to me, it’s the reason why I’m here today. Not just in “Hemlock Grove,” but I couldn’t even have directed “Bringing up Bobby” without the help of having been in a Bond movie. That’s the way I see it. It really catapulted me into…some type of stardom, I suppose. [Laughs.] Some level of recognition, anyway! So it was great. And I’m still very grateful.